Driving a forklift is more complicated than driving an ordinary vehicle. Once you have the proper training to operate a forklift, it will still take a focus on safety – and lots of practice. 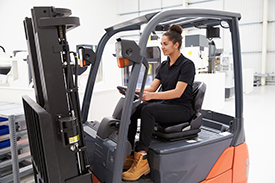 Here are 5 tips for new forklift operators that will help take you from novice to expert. When you’re operating a forklift, err on the side of wearing clothing that’s on the looser side rather than the tighter side. Operating a forklift requires concentration, so you don’t want to be distracted during a long shift by uncomfortable clothes. Bright or reflective clothing, such as a high-visibility vest, will also alert those around you that machinery is in use. Wearing long pants instead of shorts will give your legs extra protection. Snug-fitting gloves will both protect your hands (especially if you’re working outdoors or in a refrigerated warehouse) and prevent oils or grease from transferring to the forklift controls. Before you operate any forklift, always inspect it. This will prevent accidents and alert you if any safety items are damaged or missing. Some best practices: Check the forklift’s fluid levels, tire condition, safety decals, and back-up alarm. Also check for any leaks, cracks, or visible damage or defects. OSHA offers a forklift pre-operation inspection guide here. One of the most common causes of forklift accidents is negligence by the operator. 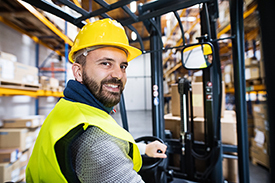 That’s why it’s imperative to pay close attention to how many workers there are on the warehouse or factory floor before you start operating the forklift. It’s also important to check vehicle traffic. Always keep your eyes focused in front of you, and constantly scan the work area for hazards. Always assume that the people and vehicles around you will move unpredictably. Keep your distance as much as possible and drive conservatively. Also communicate with your coworkers, telling them where you are and what you’re planning to do while operating the forklift. It’s also important to minimize distractions. Keep your hands free at all times and don’t use any electronic devices while operating the equipment. If you don’t feel comfortable carrying a load or maneuvering a forklift into a tight space, don’t be afraid to say so. It’s better to ask for help than to cause an accident. Also, there’s no such thing as too much training. Even after you get forklift certified, watch other forklift operators for tips and best practices, and never hesitate to ask questions.